I feel they did not, I worked on them at Uni, and we knew they had limited applications. I think the marketing over sold them, so they ended up in applications they were never suitable for, hence there was a fierce backlash against them. I still feel they should still be investigated as an option where upgrading of concentrate can be achieved through froth washing. I would be interested to hear some opinions from people on the flotation cell design side. I'm curious from a mechanistic standpoint how have collumn cells failed? I have not had any experience with them, but have had with column processes in other applications - gas-liquid reactors, liquid-liquid extraction, and distillation. What aspect of the hydraulics have not lived up to expectations? Are they too tall, what determines the flooding point for air or liquid? I think of column liquid-liquid extraction columns (or even distillation columns) and note that they represent multiple equilibrium stages stacked vertically. Can that not be done with flotation? What has been tried regarding stacking of perforated distributor plates spaced vertically? At least this would limit the coagulation of air and liquid into large bubbles or masses. Would that help? We successfully installed and operated two separate column flotation cells back in the early 1990's in a nonmetallic processing operation. One unit was used in a rougher flotation application, removing iron mineral contaminants from a feldspar/quartz final product, while the other unit was used as a final cleaner flotation application for our primary product, a spodumene concentrate. Although the learning curve was lengthy, from on-site pilot plant operation to small-scale operation to final full-scale installation, we were happy with its overall performance in our facility. Without wishing to be too simplistic, I think column cells were just rapidly overtaken by pneumatic cells (Imhoflot, Jameson etc) which shared the floorspace advantage over mechanical cells, but had a headspace advantage over columns and equal if not superior flotation performance. When operated correctly with wash water and positive bias, they are good for making concentrate grade (albeit at the expense of recovery). Modern float circuit design is an economic optimization exercise in which the final circuit configuration is that at which the project NPV would decrease by either adding equipment or removing it (in theory, anyway; often we are limited by missing or wrong information). For this reason, columns tend to find a place as the last flotation stage or stages in a typical cleaning circuit, where the objective is making a good concentrate grade without worrying too much about recovery (because you have cleaner scavengers treating the column tails). For this application, the capital and operating costs can often be reduced by using columns, rather than a series of mechanical cells that would require very slow pulling rates in order to reduce water recovery and solids entrainment to the concentrate. The grade-recovery curve of a column can be pushed to the right by installing hydrodynamic reactors (as in the Contact Cell, Jameson Cell, MicroCell, etc). I think this is where columns will go in the future. Also note that I've had bad luck with columns and other pneumatic cells in any kind of application in which agitation is important. I'm thinking of inverse flotation of silica using starches-- typically a lot of mixing is required. On a historical note, I seem to recollect that he earlyflotation cells became only successful when they became "mechanical", i.e. agitated by impellor. In a way, the flotation columns of the 80's were a return to the non-mechanical early cells. Every adventurous mill metallurgist with a large diameter pipe and an air sock in stock had a go at column flotation. Many of these devices ended up in the scrap yard, their trial unreported. Some succeeded and were described in the various Conferences Barry has referred to.In a way it was an industry reaction to the high cost per cubic feet of the cells available then, 50 cu ft being the norm for a long time. They became obsolete with larger mined tonnages. The "unit" cell was another industry reaction, providing lower cost volume. The flotation cell manufacturers did not lead here, they followed. Returning to the flotation column, John C. Schneider, inventor of the PROCHEM hydrofoil agitator and its supplier to the industry, formed the opinion in the mid 80's that flotation column efficiency would only become equivalent to that of the mechanical cells by the columns becoming... mechanical! Thus the agitated flotation column concept was born. I was the person charged at the time with reducing this concept to practise. In 1987, PROCHEM installed a 1.6 m diameter, 6 m high, 5 stage agitated flotation column at Dickinson Gold mines in the Red Lake camp, N.Ontario.The column handled 100 t/day AsPy rougher con (produced from filtered cyanide leach residue), yielding approx. 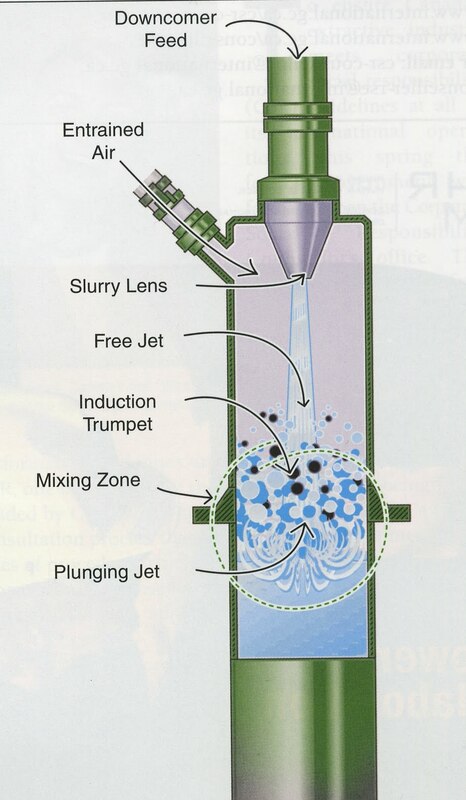 25 t/d final concentrate (Column Flotation,'88,Chapter 31,pp.287-292). More on this installation can be found in CIM and CMP archives. It operated for years, but was never studied in detail by PROCHEM, nor by Dickinson. PROCHEM did not want to be industry leader and Dickinson lost its customer for auriferous AsPy concentrates. By the time Dickinson morphed into Goldcorp, the equipment needed replacing; PROCHEM was out of business and another mineral upgrading experiment ended. My personal view on agitated columns sees them as scavengers, by having multiple stages on top of each other, one can develop a deeper froth layer and apply more effective froth washing on scavenger concentrates. Agitated column development will need the input of an agitator manufacturer; it takes specialized knowledge to design long, multiple, stable! impellor shafts. Recently, two type of injectors column flotation cells have been in practice. As such, the agitation and kinetics for large particle is taken care as well as the small bubbles and drainage and entraintment mechanism controlled using the wash water. I beleive the good understanding of the hydrodynamics and particle/species understanding are a fundamental step to getting the practice requered for optimization of mineral separations. You tuve version of a Froth Flotation Dynamic Simulator. Recently, flotation cells/collumns with two type of bubbler/mixing have been installed a large copper sulphide concentrator in Chile. I beleive the good understanding of the hydrodynamics and particle/species flotation kinetics are a must to understand the dynamics of the froth flotation. Froth flotation is a zero order hydradynamic machine following a fluz curve behavior. Attached is a Dynamic Froth Flotation Similutor which models both the hydrodynamics and the particle kinetics of the froth flotation machines (Agited or Columns). The new column flotation machine have a bubbler for the agitation and large particles and a small sparger for small particles. By having the right entrainment and drainage rate (wash water) the optimal separation can be achieved. Attached is You Tube recording a a Dynamic Froth Flotation Simulator.